LONG BEACH, CA (Laserfiche)—December 15, 2009—Laserfiche today announced that it has renewed its records management certification with the DoD 5015.2-STD version 3 standard. 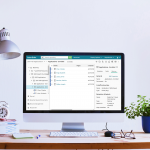 Furthermore, Laserfiche has extended the certification beyond electronic records management to include physical records management through integration with technology provided by Infolinx, a Laserfiche Professional Developer Program partner. The new certification includes integrated physical records management through Infolinx, which brings physical records management features such as barcode and RFID tracking, space management, inventory reconciliation and online requesting and transferring of records to Laserfiche.